Last night I finished the hat for Jessica that goes with the fingerless gloves. Still needs to be blocked. I’m just happy that I don’t have to work with this yarn anymore. On today’s agenda is stocking up on oxygen tanks for tomorrow’s thanksgiving trip, pick up a few items at the grocery store and then back home for a baking marathon. Note: Kerry the cookie baker, says that the recipe on the back of Toll House Choc. Chips is what she uses. But, she substitutes butter flavored Crisco sticks for the butter. The butter is what makes the cookies come out flat. Her other hint is for moister, chewier cookies substitute molasses for half of the brown sugar. Since I will be executed tomorrow for giving away her baking secrets, this may be my last post. I baked cookies! I don’t remember the last time I felt like baking. I made Dark Choc. Mixed Berry Walnut Cookies. The cookies taste really good, but they came out kind of flat. The mixed berry part is from a bag of dried cranberries, blueberries, cherries and strawberries that I got from Sam’s. I contacted daughter Kerry (cookie baker extraordinaire) about why cookies came out flat. Hopefully next batch will be better. Plan to bake again tomorrow since I will be making pumpkin pies anyway. 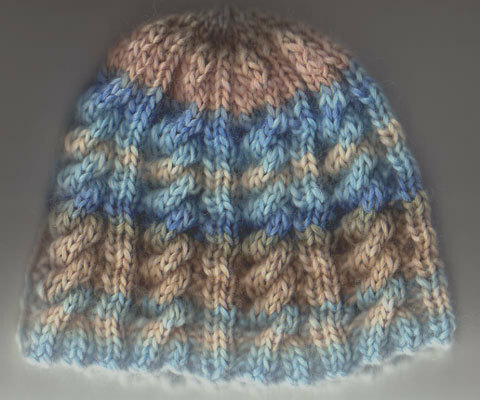 Knit on J’s hat last night. Have one more cable repeat to do and then can start decreasing. Hopefully can finish tonight. The yarn came apart 2 more times last night. I’m going to be contacting Patons about it, may not help with their quality control, but at least I can vent bring it to their attention. Did I mention that I don’t like this yarn? I cast on for J’s hat last night. Knit the ribbing and half of the first cable pattern. 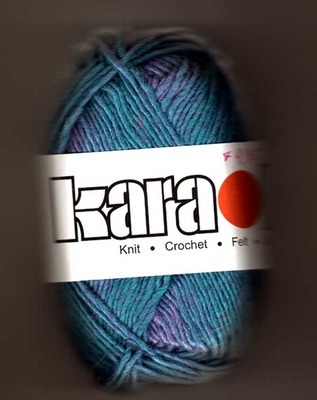 Pattern called for size 8 circulars and dpns. Closest I have are size 9 dpns, so that’s what I’m using. 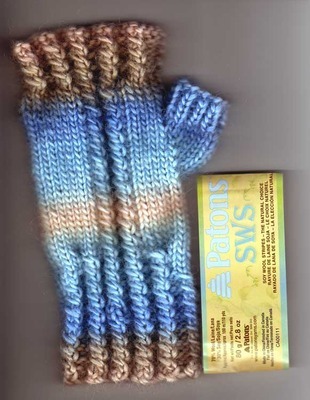 As I posted earlier, this Patons SWS looks good in a finished product but is a pain to work with. Last night I had part of it just untwist and pull apart while I was knitting. This is going to have enough spliced spots in it, from trying to match colors in the gloves, without adding another one because of crappy yarn. 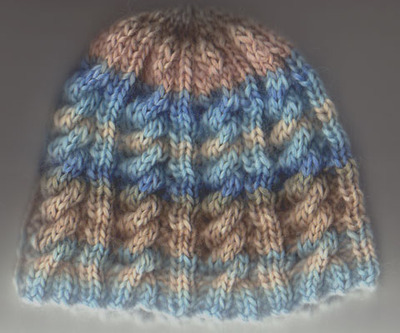 Last night I had planned on casting on for Jessica’s hat. That didn’t happen. Felt like I had iron bands around my left lung that wouldn’t let it expand. So I just sat in my chair sucking up oxygen from the concentrator. From the “Things that make you go Hmmm?” department – If I sit still I will doze off for 5 to 10 min. at a time. But, if I go to bed I can’t sleep. What’s up with that? Wish Ambien didn’t give me such awful nightmares. Today I need to pack up some glassware, mugs and steins for the kids. Will take it to them on Thanksgiving. My son, Steven, is cooking Thanksgiving dinner at his house this year. I’m taking a few items for the menu, but mostly just get to relax and visit. My son and daughter and their families live about 2 hrs away, so don’t see them very often. It’s time for football. Maybe some knitting will get done today. Just got back from Office Depot and I think I may have found my new sewing table. It’s wide enough for both my sewing machine and serger with room for me to roll my chair from one to the other. The table has a melamine laminate top with rounded edges and is very sturdy. Added bonus is that it is gray and will match my chair. Finished the second of the fingerless gloves for Jessica. I think there may be enough of the SWS yarn to make a matching hat and use up what’s left of this yarn. Found a pattern that I will cast on for tonight. Let you know tomorrow how it works out. Now I need to get ready and go look at desks for the sewing room. Wish me luck. My DIL is having a birthday this month. So I decided to make her a pair of fingerless gloves. She’s a photographer so I think they will come in handy. Jessica will be able to keep her hands warm and still use her fingers. 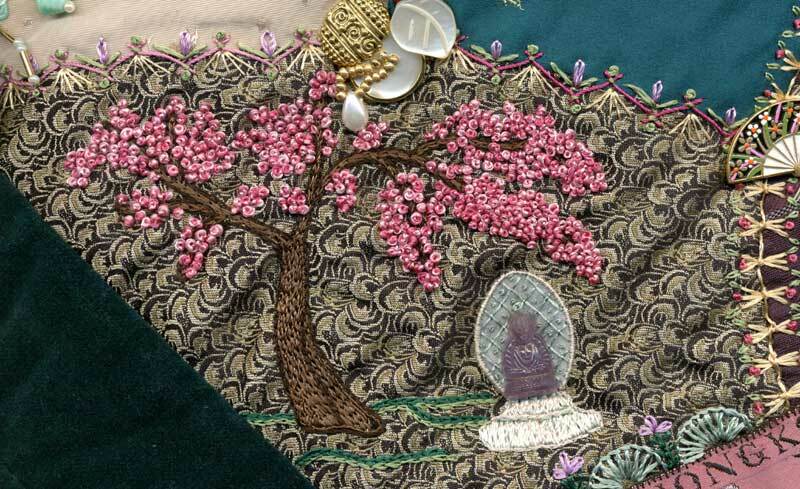 I’m using a free pattern from SWTC (South West Trading Company ) that was written for their Karaoke soy silk/wool yarn. I have a skein of the Karaoke in color #285 Intensity(above), but decided to try the pattern out with a skein of Patons SWS soy wool stripes in color Natural Blue. The Patons yarn is very loosely spun and splits like crazy when it isn’t twisting apart. The finished glove looks and feels nice, but I don’t think I will be knitting with this yarn again. The pattern calls for one skein of yarn but these gloves took 2 skeins because both skeins I had were joined with a knot about halfway through the skein. And the join wasn’t even close to the patterning of the yarn. Comparing the Karaoke and the SWS together, the Karaoke has a tighter twist can’t tell about possible knots or joins until I use it. From everything I’ve heard and read about Karaoke yarn I think I will like it.